Willow from California sent us this letter and photo of Gus, a neglected dog who lived on a chain for 14 years before she rescued him. Good for you, Willow!! I hope your story will inspire others to step up and help a chained dog. I am writing to tell you how pleased I was when I discovered your organization on the web. The work all of you do is so vital to protecting the quality of life our beloved dogs deserve. 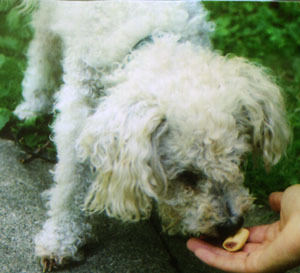 I rescued a neglected older Bichon Friese (14 years old) in January, 2004 from the exact same situation you deal with. Gus was tied to a 6 foot fence in his backyard up to 12 hours a day in the warm months. He had no view, no companionship. No toys. All he had was a dirty dog bed that was left outside and got rained on, and a dirty food and water dish. Often times, I would find he was left without any food that day at all, or it had been molded over from exposure to the weather. I even found infestations of insects at at times. The poor baby had no shelter from the hot sun or rain, and except for his dirty dog bed, had to lay on the concrete space he was chained to. I discovered Gus because his owners had lived on the same block that my parents lived on. I grew up with these people and was shocked to discover the neglect their dog suffered. There as no excuse. They were an older couple with the time and money to provide for their dog. They were master gardeners. But they never, ever walked their dog. I decided I had to get involved. I thought I had to avoid making them feel defensive, so that I could get as much access to Gus as I could, and my approach worked. At first, I asked if it was OK to visit Gus in their backyard. I’d go and bring him treats and sit with him. But because he was so isolated and undersocialized he didn’t seem to notice I was even there at first. He was anxious and high-strung and would just try to get to the gate to free himself. After awhile, I got permission to walk him. I brought him a collar and leash and started walking him once every day. I’d go over to his neighborhood before or after work, and he soon acclimated to his new schedule and greatly looked forward to his hour of freedom. I walked him for 7 months. I was never paid, I was never thanked, but my reward was watching Gus unfold every day into a happier and more trusting dog. We became very good friends and I felt in my heart that I was doing the right thing. Eventually his owners came around, and they let me dog-sit when they went out of town. Thy even gave me a key to their house and the alarm code. We established a friendly rapport. By winter, Gus was moved to their basement (where they had him sleep, or kept him when it was too cold to have him outside.) That meant he slept all his days and nights alone on a tie-out in a basement used for storage. Since they never housetrained him (their excuse for why he was an outside dog) they let him pee and poop in the basement wherever he wanted. It was rarely cleaned up. The only source of light was one light bulb they kept on for him. This was a bleak existence. In January, 2004, I finally got the OK to adopt him after 7 months of daily care. His owners were ashamed he wasn’t housebroken, and didn’t think I’d want to take that on since he was on older dog. I gladly did. The transition was a very friendly one, and surprisingly easy on Gus. Now Gus is an un-chained dog! He follows me around the house as my devoted companion. He sleeps in bed with my husband and I. He’s gone to the vet to clear up the health problems he had (and was finally neutered after 14 years). Gus has been professionally groomed for the first time in his life. All his mats were shaved off and he’s got a new coat growing in. He’s a happy little guy, and the love of our lives. It was only now, after I rescued him, that I discovered your group. But I will pass the word along about what you do. For Gus’s birthday, I was thinking of having a small fundraiser for your organization in honor of Gus. I wanted to share with you another success story to add to your own. I hope our story encourages others to get involved when they see neglect or abuse happening. We can’t turn away. The two magic keys to rescue are determination and patience. It worked for us!